Affordable housing will be built on the site of a club where fans of Olympic champion Jade Jones celebrated her 2012 taekwondo triumph. 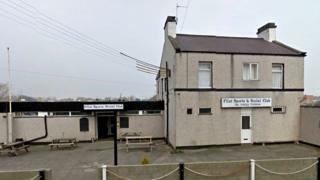 Jones was a member of the Flint Sports and Social Club, which also hosted a party in her honour before she set off for victory at the London Olympics. However, the building was in poor repair and demolished in 2015. Flintshire planning officers have now approved a housing association's plan for a block of 12 apartments. The scheme will include two specialist flats for wheelchair users and two for obese people in need of bariatric care, according to the Local Democracy Reporting Service. In a planning statement, Wales and West Housing said the scheme was "designed to meet a specific need" and had been drawn up in consultation with the council's disability services. "The building was demolished in 2015 and the site has remained vacant except for occasional use as a storage area for building materials," the statement said. The association stressed that its scheme would not result in overdevelopment of the site, and had sufficient space for access, parking and landscaping. As well as four specialist flats, the block will include seven one-bed flats and one two-bed facility for people with general health needs. Although the social club where fans toasted her 2012 triumph has long gone, a nearby leisure centre is now known as the Jade Jones Pavilion. Jones won gold again at the 2016 games in Rio de Janeiro, Brazil.